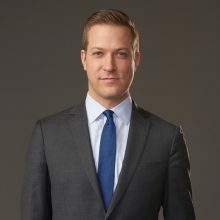 Based in New York, David Gura is an anchor and a correspondent for MSNBC, and a correspondent for NBC News, traveling widely — in the United States, and around the world. Recently, he has reported from Beijing, Bogota, and Mexico City. Gura has spent most of his career as a business reporter, focused on policy and economics. Before he joined MSNBC and NBC News in 2015, Gura worked for Bloomberg Television and Bloomberg Radio. He co-anchored “Bloomberg Surveillance,” the network’s flagship morning program. Previously, Gura was a Washington correspondent for “Marketplace,” the public radio business and economics program, covering budget battles, showdowns and shutdowns, and the implementation of financial reform. But he spent a lot of time looking at how policy decisions played out beyond the Beltway. Gura regularly hosted “Marketplace” and the “Marketplace Morning Report,” from Washington, New York, and Los Angeles. Gura’s work has been recognized by the National Press Foundation, the National Constitution Center, and the French-American Foundation. He was awarded a Paul Miller Washington Reporting Fellowship, and he is currently a term member of the Council on Foreign Relations. An alumnus of the Columbia University Graduate School of Journalism, Gura received his bachelor’s degree, with honors, from Cornell University. He also studied political science in Bolivia, at the Universidad Mayor de San Andrés and the Universidad Católica Boliviana.